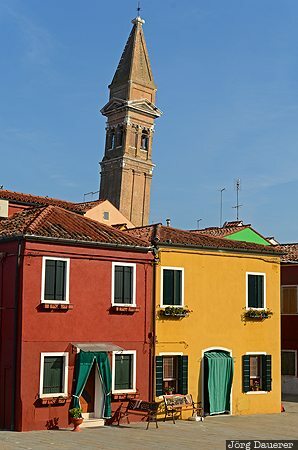 Typical colorful houses in Burano with orange and red facades below a blue sky with the leaning campanile (tower) of the church San Martino in the background. Burano is an island in the Venetian Lagoon, northern Italy. This photo was taken in the early afternoon on a sunny day in October of 2011. This photo was taken with a digital camera.